Overshadowed just a bit by that little series getting ready to premiere this Sunday we know as Downton Abbey, Mr. Selfridge, starring Jeremy Piven and Katherine Kelly, which airs on ITV1 in the UK and PBS in the States as part of the Masterpiece series, will return in 2014 with 10 new episodes. 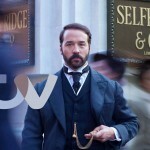 Based upon the life of flamboyant American entrepreneur Harry Gordon Selfridge, who founded the world-renowned store on London’s Oxford Street in 1909, the second series jumps ahead four years from the series 1 finale picking up the story in 1914 as the store celebrates its 5th anniversary of trading. With filming for series 2 continuing, cast and crew got back to work this week transporting the London streets back to Edwardian times. Series star Aisling Loftus (Agnes Towler) was back in costume and looked every inch the turn of the century girl. Agnes has been working in Paris and returns to London in episode one to work for Harry as Selfridge’s new Head of Display. With the fashion and style influence of the Parisians, Agnes turns heads with her sophisticated new look. 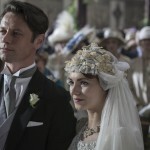 Following the departure of his wife Rose (Frances O’Connor) for America at the end of series one, Harry has become accustomed to the life of a single man in London as the couple become increasingly estranged. But when she returns to British shores to celebrate Selfridges’ fifth anniversary of trading, Harry is determined to win back her affection. Getting in the way of Harry’s plan is Rose’s new friendship with bohemian novelist and businesswoman, Delphine Day, played by Polly Walker (Rome, Waking the Dead, State of Play), whom she meets on the boat back from New York. Adding to Harry’s woes is his increasingly troubled relationship with business partner, Lady Mae Loxley (Katherine Kelly) as Aidan McArdle (Garrow’s Law joins the cast as Lord Loxley, returning from ‘the countryside’. Another cast addition sees Cal Macaninch (Downton Abbey) cast is newly appointed head of fashion, Mr Thackeray. While Harry is proud of the store’s success, there is no time to rest on his laurels. With rumors rife and talk of war in Europe, he prepares staff for challenges times ahead. With World War One imminent and set to be the greatest and most devastating in history, it will inevitably affect the lives of everyone in the store. Throughout these troubled times, Harry will turn to his family and friends and try and heal the rifts of the past. According to ITV, series 2 will transmit in early 2014 to mark the 100th anniversary of the outbreak of the First World War. U.S. broadcast as part of PBS’ Masterpiece series is tentatively set to begin not long after on Sunday, March 30, 2014.